I guess the Grand Tour organizers really mean it; RCS today announced the Giro's team lineup, and they've left out ProTour team 19, Unibet.com. RCS also initiated a new system, where three ProTour teams (Caisse d'Epargne, Gerolsteiner, and Rabobank) have the option to race or not race in the Giro and Milan-San Remo. If the three option teams choose to race, the RCS will name only 4 wild-card teams to the final race field. For Milan-San Remo, the same rules apply, but RCS will select six to nine wild-cards (depending on ProTour commitments) from the above list plus Ireland's Tenax-Salmilano, for 24 total teams. The Grand Tour organizers and the UCI have been feuding over the ProTour, which required all teams to race in every event, and required race organizers to set aside 18, and now 19, places for ProTour teams. RCS, ASO, and Unipublic prefer more wild cards. The UCI is planning to ask the European Commission to intercede in the ongoing squabble between the UCI and its ProTour and the organizers of the three grand tours: The Tour de France, the Giro d'Italia, and the Vuelta a España. The UCI has today decided to prepare a formal complaint to the European Commission concerning the anti-competitive conduct of the organizers of the Grands Tours. The organizers of the Grands Tours have acted as a cartel in order to protect their own dominant position in the field of professional road cycling. In particular the organizers of the Grands Tours have deliberately tried to undermine the development of the UCI ProTour. This conduct is detrimental to the interest of teams, riders and the wider development of cycling in Europe and in the world as a whole. The UCI has repeatedly tried to engage the organizers of the Grands Tours in a constructive dialogue; however they have refused to cooperate in any meaningful way leaving the UCI with no alternative other than to seek intervention by the European Commission in this matter. I find it hard to side with the UCI on this one: The national tours own the crown jewels of the sport (not just the GTs), and the UCI is trying to get them to treat their biggest events like every other race. If you agree with the UCI, make your case in the comments. procycling | Tour, Vuelta and Giro "will never join ProTour"
Patrice Clerc, president of Tour organizers ASO, says his organization, Vuelta a España organizers Unipublic and Giro d'Italia organizers RCS, have given up on integration with the UCI's ProTour. The grand tour organizers don't want their races to become merely the longest of the ProTour events, and so had lobbied for fewer ProTour teams (and correspondingly more wildcard teams in the GTs) and for a system of promotion and relegation like European football. If in fact the alliance is over, the grand tour organizers take with them many of the season's best-known races, including Paris-Roubaix, Liège-Bastogne-Liège, and Milan-San Remo. Grand Tours to ProTour: Drop dead! The Tour de France, Giro d'Italia, and Vuelta a España are splitsville with the UCI's ProTour. After more than a year of negotiations turned to squabbling, the big 3 can see no reason to stick with the newish ProTour, which the UCI hoped would become as well-known as other season-long sports tours, like the PGA tour. In a joint statement released Friday, the Grand Tour sponsors say the ProTour was fundamentally unfair because all events were worth the same points, and because race-winning teams who weren't part of the ProTour, including Comunidad Valenciana and Panaria, earned no points. This removes not only the three-week tours, but their sponsored events, including Paris-Roubaix, Liège-Bastogne-Liège, Milan-San Remo, Paris-Nice, Paris-Tours, the Tour of Lombardy, Flèche Wallonne, and Tirreno-Adriatico from the ProTour. The big 3 will still allow all ProTour teams entry in 2006, if they desire, but in 2007, they plan to take the 14 highest-scoring teams on a new points system, plus up to 8 wildcards for each tour. Patrice Clerc, the president of Tour de France organisers, said: "Maintaining for 2006 the agreement we had for 2005, in other words a status quo, makes no sense because the situation was only a transition aimed at reaching a global agreement on the Pro-Tour, which the UCI are now saying they will not come up with." To encourage squads to ride all three Grand Tours, which the ProTour rules required, organizers will pay a 100,000 euro bonus to teams participating in the Vuelta, Giro, and Tour, and will bring back the Trophee des Grands Tours, with a 2 million euro total split among the 7 teams with the best combined performance in the national tours. Outdoor Life Network will offer two hours of coverage for each Saturday and Sunday stage of this year's Giro d'Italia. If 16 hours of Phil Liggett, Bob Roll and Paul Sherwen won't cut it, they're also selling web-streaming of the weekday coverage ("without commercial interruption") for $5.95. No word on the technical details, and no sign-up is yet available, but it's likely to be linked from their main cycling page when it is. You can download their release (in Microsoft Word format(?)) here. Update: the service is provided through MediaZone in Windows Media, with no Mac support. France's AG2R squad will join the 20 ProTour squads in this year's Tour de France. The announcement leaves Agritubel and a few other hopefuls on the sidelines for this year's Tour. It also leaves the Tour 9 riders shorter than in many recent years, when ASO has invited 22 squads. Next month's Giro d'Italia will be a more democratic affair, with 24 squads competing, better representing Italian cycling. The route for this year's Giro d'Italia was unveiled on Saturday. Of note is the "prologue" May 7th: It's 1.15 km long. That's not a misprint -- the Giro will kick off with every rider giving his all for 2 minutes. "I can only say that on paper I like this Giro, but I will need to go and have a look at it to get a better idea," said the 23-year-old. "It seems to me like the tour will suit the climbers, but we'll see." There are 5 big climber's stages, 2 ITTs (plus the prologue), and 10 sprinter-friendly stages already marked on Alessandro Petacchi's calendar. Over at Cyclingnews, Tim Maloney tips a battle between Cunego and CSC's Ivan Basso, who hasn't ridden the Giro in 5 years. Maloney gives longer odds on Stefano Garzelli, or Discovery's Paolo Savoldelli, nursing a broken collarbone. The world's fastest closer will skip the Tour de France this year. Alessandro Petacchi, who won 4 stages of the 2003 Tour but faltered in 2004, will instead focus on winning the biggest one-day race in the world, the road World Championship, this year in Madrid. Petacchi will also race (but probably not finish) the Vuelta a España, which finishes one week before Worlds. Petacchi, who set a record last year with 9 (!!!) stage wins at the Giro d'Italia, will also contest the Italian grand tour in May. Organizers of the Tour de France, the Giro d'Italia, and the Vuelta a España have agreed to be part of the 2005 ProTour, guaranteeing the new tour's teams entry in all three events, and 8 others run by the grand tour organizers. Representatives of all three races still have reservations about the new system, and have asked UCI president Hein Verbruggen for changes before the 2006 ProTour. The three major tour organisations, ASO (Tour), RCS (Giro) and Unipublic (Vuelta), restate in their letter to Verbruggen that they still want to see the development of an ethical code, the introduction of some form of promotion/relegation format for the ProTour and a written understanding about TV, image and other rights relating to events. Cyclingnews.com quotes from an interview between Lance Armstrong and La Gazzetta dello Sport. Apparently, Armstrong is training in the Italian Alps, and rode the Mortirolo, the hardest climb in Saturday's Stage 19 of the Giro. "It's a terrible climb...it's perfect for a mountain bike. On the hardest parts, I was riding a 39x27 and I was hurting, really hurting. (Mortirolo) is the hardest climb I've ever ridden. My time up the climb? It's not important; I rode the Mortirolo to have some fun and ride with the 'cicloamatori'...there were a few raindrops, but it was a great day. All the standard last-stage shots are here: the jersey winners all together, the winner's team (notably missing is Simoni), and the sprint winner, Petacchi. Italy's newest cycling hero had his coming-out party in Milan on Sunday, as Damiano Cunego finished off his biggest victory, in the 2004 Giro d'Italia. Cunego becomes the races youngest winner since Giuseppe Saronni in 1979. On the stage, Alessandro Petacchi extended his modern Giro record for stage wins to 8, ahead of Marco Zannotti in 2nd. Cunego's GC lead was attacked, by Saeco teammate Gilberto Simoni among others, on Saturday, but Sunday's flat stage was more of a coronation. Serhiy Honchar finished in second overall, 2:02 back, while 2001 and 2003 Giro winner Simoni was 3rd. "His future is incredible, he can win many races. He's already four or five years ahead of the others," said Saeco's sport director, Giuseppe Martinelli. "He's not your typical rider. He's a strong climber, but has a quick sprint. "The first win was a liberation and the last was something special, but all the victories were important," Petacchi told Reuters after leading the pack home again on Sunday. "After three weeks of racing and all the mountain stages I was very tired, but I was pleased the way I won the sprint. I had another great lead-out from my teammates and Zanotti and the other sprinters were well behind me at the line." Though team officials tried to play it down, the split within the Saeco team has been the major story in the Italian press. "Cunego deserved to win this Giro," Martinelli insisted. "He proved he was the strongest and the team supported him. For him to win is incredible. No one expected it." Following Cunego's Saturday-morning press conference, Saeco riders and staff dressed in pink to pose for a picture - except Simoni, who refused to join the love fest. One newspaper reported Simoni would try to break his final year with Saeco to join another team, possibly Quick Step or his former team Lampre. It's certain that the two men will not ride this year's Tour de France together, whether as teammates or as rivals - Cunego says he might not tackle that grand tour until 2006. As for Simoni, he refused to talk about the upcoming Tour. Part of his plan for the 2004 season was to come into the Giro fresher with the idea to be stronger in July. "I don't want to think about the Tour. I've been racing for 20 days, and all I want to do is go home and see my family," Simoni said. "After that I'll come up with some plan to conquer the world." Eurosport has an excellent look at the career of Damiano Cunego, the Giro d'Italia champion-in-waiting, who's likely to take the biggest victory in his career later today in Milan. The Eurosport article goes so far as to compare Cunego to 3 former champions: Marco Pantani, Bernard Hinault (the only Giro winner with more stage victories than Cunego's 4), and Fausto Coppi himself (one of few Giro winners younger than 22-year-old Cunego). When during Thursday's first Dolomites stage from San Vendemiano to Falzes, it became clear that it was not Simoni's day, Cunego pounced on his date with destiny, securing the pink jersey and signing the deed the next day with the win in Bormio. And what's next for Cunego? He won his junior world championship in Verona, his hometown in 1999, and the city plays host to the senior road worlds this year, so mark Cunego as a favorite there. Damiano Cunego of Italy's Saeco team has taken over the lead at the Giro d'Italia. Cunego put more than a minute into all opponents with a solo breakaway with 12 kilometers to ride. Two-time defending champion Gilberto Simoni, Cunego's teammate, lost 2:30 on the stage, and sits 4th, 2:38 back. Cunego is one of the great young hopes of Italian cycling; he was the world junior road champion in 1999. Cunego paid justifiable tribute to his team-mates, especially Simoni as the two-time champion had set out at the start of the race as the team leader but had confessed earlier in the event that if Cunego was stronger than him then he should go for it. "'Gibo' (Simoni) is a great leader, a true champion" said Cunego. "He left it to me to race my race. The situation is a little complex but he accepts it at the moment. "We will carry on racing alongside each other, without annoying one another." Former race leader Yaroslav Popovych lost more than 4 minutes Tuesday, with more climbing to come. 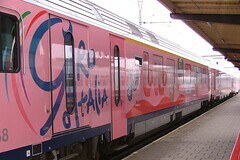 "The pink jersey in Milan? There is still a long way to go," said Cunego. Simoni played along with Saeco's team tactics, perhaps at his own expense. The two-time Giro champion could only watch as Cunego rode to victory in the 217km stage from San Vendemiano to Falzes. "Damiano was the strongest today and the team supported him," said Simoni, who fell to fourth at 2:38 back of his young protégé. "It puts us in good position to win the Giro once again, which is the top goal for the team." Robbie McEwen has abandoned the Giro d'Italia, avoiding the last week of mountain climbing to focus on the green jersey competition at the Tour de France. "I've already had a lot of racing this season and I've got to think of the Tour de France," said McEwen, second in Monday's 15th stage behind Italian Alessandro Petacchi, before he flew home to Belgium. Alessandro Petacchi surprised no one today when he set the modern record for stage wins in a single Giro d'Italia. Petacchi edged Australia's Robbie McEwen and Germany's Olaf Pollack for the stage win. Four riders were as much as 10 minutes ahead of the field early, but the Fassas brought them back to give Petacchi a shot at the record. "It is the stage that I fear the most," said the 24-year-old, who holds a lead of 1:27 over defending Giro champion Gilberto Simoni. "I know I am going to be attacked and it is feasible that I will lose the maglia rosa. After that I will just take each stage as it comes." "There are still two stages left where sprints are possible, this Monday and next Sunday. But the next stage is long and the team is starting to feel the effects of working for me so much. "Plus, the mountains are just around the corner and we have to think about saving some energy." 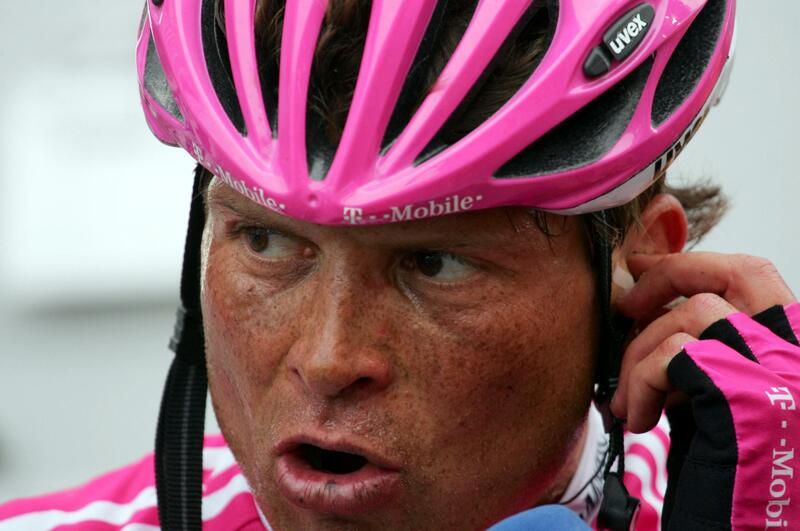 Petacchi added: "Seven victories - it hasn't quite sunk in. To equal Saronni is just unbelievable. He was on[e] of my idols." How many Giro stages will Petacchi win? Alessandro Petacchi is just unbeatable at this stage of his career. I can't remember anther sprinter who just took stages by the fistful like he is right now. Today he took his fifth stage (of 10 so far) in the Giro d'Italia. Giro rest day update: Fast Freddy stage win; which Saeco? “I learn something new from Gilberto everyday,” Damiano Cunego says. “Damiano is giving me a big hand by sharing the responsibilty of the team leadership,” explains Gilberto Simoni. Simoni says he's marking Stefano Garzelli as a rival for the overall race victory. The Daily Peloton also has three pages of photos from the Giro prologue, back on May 8th. Friday is a key stage for Alessandro Petacchi, whose team sponsor, Fassa Bortolo, and bike sponsor, Pinarello, both hail from Treviso, where the stage ends. Alessandro Petacchi's 2004 is looking a lot like his 2003: If he shows up, and there's a sprint, he's going to take it. Sunday, he took the Giro's eighth stage, for his 4th stage win so far. Robbie McEwen took 2nd, and Lithuania's Tomas Vaitkus was 3rd. McEwen is the only man not named Alessandro to win a sprint stage so far this year, when he took Thursday's stage. Damiano Cunego of Saeco continues in the pink leader's jersey, after his masterful stage win on Saturday. Eurosport.com | The Tour? I won't go. Mario Cipollini dropped out of the Giro on Saturday. The Lion King holds the record for Giro stage wins, but hadn't won a stage in this year's Tour of Italy, the first time he's come away empty-handed. "It is possible that my career will stop here. It is difficult to find stimulation. For now, I don't want to think about the Tour de France," Cipollini told reporters. Of course, Cipo announces retirements like J-Lo announces engagements; this is at least the third I remember. Procycling.com also has a very good wrap-up of Cipollini's Giro, and his current state. For everything you ever wanted to know about this year's Giro, check out Daily Peloton's Giro d'Italia page. The official Giro page doesn't have the teams yet, but has race details in English, Italian, and French.